By @SimonCocking. for details of a preview and how to buy the book see here. 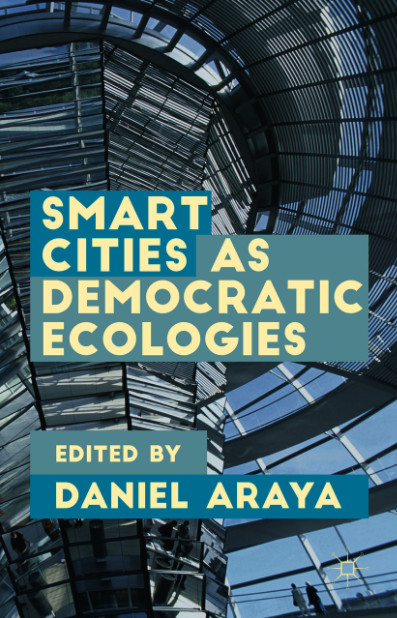 This collection focuses on technology-driven changes in democracy and civic engagement in the design and development of the ‘smart city’, exploring new urban literacies and emergent social practices. Having just visited Singapore, courtesy of the Singaporean IDA, it was great timing to read this book. Many cities around the world, from Dublin to Singapore, as well as many US and European cities too are all trying to work out what it means to be a smart city and how to achieve this. Chapter 6 “Are creative and green cities also smart and sustainable” was especially interesting. It raised the point that many cities focusing on technologically sophisticated solutions have not necessarily considered if they are also ecologically intelligent and achieving optimal sustainability results. The authors of this chapter, Kevin Stolarick and Olga Smirnova feel that smart and sustainable are not necessarily included as goals to be considered as complimentary and desirable. Similarly from visiting Dubai and also Singapore, two cities with some great smart city credentials, anecdotal feedback suggested the reason you can’t see any recycling taking place is because it is being burnt in the desert or buried in landfill. Which suggests that technology alone will not solve all of the challenges of city living. In many ways of course there are great and potentially wonderful and exciting possibilities for the future of our cities. In this context the book does a good job of giving you a whirl wind tour across the many possibilities taking place globally. However at times the chapters are too short to really get into anything before they are already reaching their extensive list of references and footnotes. In a similar vein the language is also quite academic and jargonistic. Maybe they were writing for a fellow academic audience, but for such an interesting subject the book could have had a much, much wider audience if it had been written in a more accessible way. Smart cities offer a great opportunity to help and improve the quality of life for the increasing numbers of us who now live there. The challenge is to ensure that smart, real time, potentially all inclusive data capture is managed in a way that is both responsive to needs of the cities occupants, at the same time as ensuring that personal liberty and privacy remain qualities to be valued.